Stellartech designs, develops and contract manufactures medical systems utilizing radiofrequency, ultrasound and other energy sources. Typically combining a disposable patient-contact device and a microprocessor-controlled instrument, these systems incorporate complex electronics for sensor feedback and controlled delivery of therapeutic energy. We also develop and manufacture complex diagnostic systems, and a range of patient contact devices such as surgical probes, balloon electrode catheters and other catheters for minimally invasive therapies. Working with companies of all sizes, we take a product idea from concept through proof of principle, clinical evaluation, regulatory approval and manufacturing. We also work directly with entrepreneurs, physicians and investment groups to incubate new device enterprises as "virtual companies" using Stellartech infrastructure. 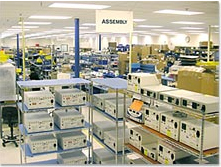 Stellartech offers you the resources of a world class design, development and manufacturing group. Our expanded 63,000 sq. ft. facility permits us to produce a wide array of Class II and Class III devices under our QSR and ISO 13485:2003 Quality System.